Rent is due 15 days before occupancy. Government issued photo ID required of each adult occupant. No subletting. No pets. No smoking. This house is located in a quiet residential neighborhood on a non-thoroughfare street in the city of Schertz. This house is about 3 miles from Randolph AFB. 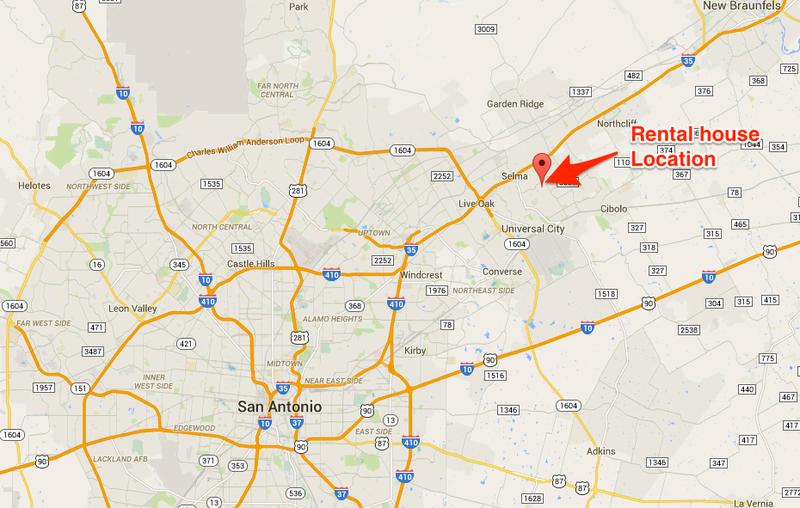 Schertz is 5 minutes north of San Antonio and about 1 hour south of Austin. The house is 1 mile from I35 providing easy access to all of the surrounding area. Local shopping is about 1 mile and provides grocery, hardware, medclinics, and restaurants of all varieties. Large shopping malls are within 5 miles. Schertz library, park and YMCA with indoor swimming pool within 1 mile. The back yard is completely fenced for security and privacy. It includes a covered patio with a patio table and 4 chairs. Landlord reserves the right to enter house during the rental period for maintenance. Landlord will coordinate with renter for date/time that is convenient for renter. Landlord reserves the right to enter the yard during the daylight hours for yard maintenance. Coordination with the renter will be provided.